Help students learn how to write fiction with 20 lessons that cover story starters, transitions, closings, elaborations, and the use of figurative language. 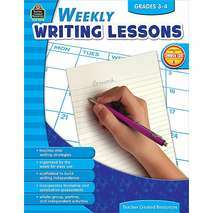 Each lesson is presented over a period of five days with one page of activities introduced each day. By the end of the lessons, students will be ready not only to write stories, but also to communicate ideas in any writing format. Lessons are correlated to the Common Core State Standards.